One of the most popular Topps sets ever produced, this is loaded with great looking cards of classic HOFers and stars. These have a tremendous breakdown value as any set collector can immediately attest. The offered set is a extremely fine and consistent, we sent many cards into PSA and received what we felt were some tougher grades. These cards are quite nice overall, the set easily averages a strong Ex-Mt/NM or better overall. There are some centering issues, mainly with the commons. Of the raw cards, they are 40% or so Near Mint, the balance almost all Ex-Mt or Ex-Mt/NM but with some centering issues. 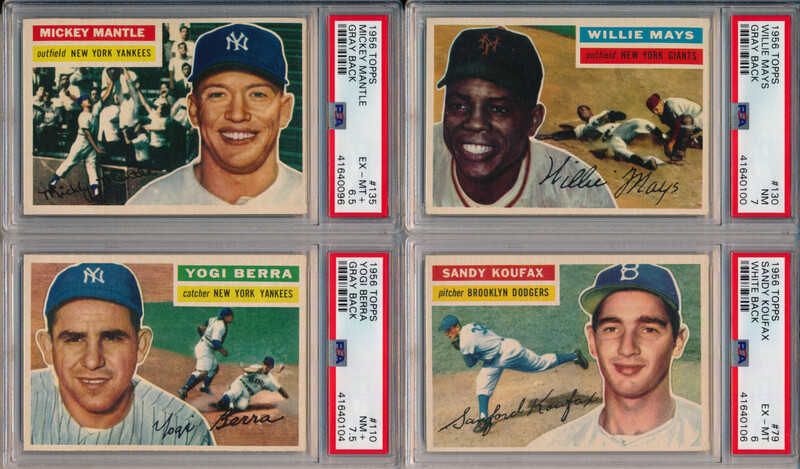 The key cards are exceptionally fine and consistent, they are as follows: 1 Harridge RC VG-Ex, 5 Williams Ex-Mt oc, 8 Alston PSA 6 (white), 10 Spahn Ex-Mt, 15 Banks VG-Ex, 20 Kaline Ex-Mt oc, 30 J Robinson PSA 6 (white back), 31 Aaron PSA 6 (white back), 33 Clemente PSA 6 (white back), 79 Koufax PSA 6 (white back), 101 Campanella Ex-Mt+, 107 Mathews PSA 7 (grey), 110 Berra PSA 7.5 (grey), 113 Rizzuto PSA 7 (grey), 121 Pirates TC PSA 6.5 (grey), 130 Mays PSA 7 (grey), 134 Cardinals TC PSA 7 (grey), 135 Mantle PSA 6.5 (grey), 150 Snider PSA 6.5 (grey), 164 Killebrew PSA 7 (grey), 165 Schoendienst PSA 7 (grey), 166 Dodgers TC PSA 6 (grey), 190 Furillo PSA 7, 200 Feller PSA 6, 213 Tigers TC PSA 6.5, 240 Ford Ex-Mt, 251 Yankees TC PSA 6, 260 Reese Ex-Mt and 292 Aparicio RC Ex-Mt. Please note the current retail value of just the 20 PSA-graded cards is approximately $5,200, providing for some outstanding value here.